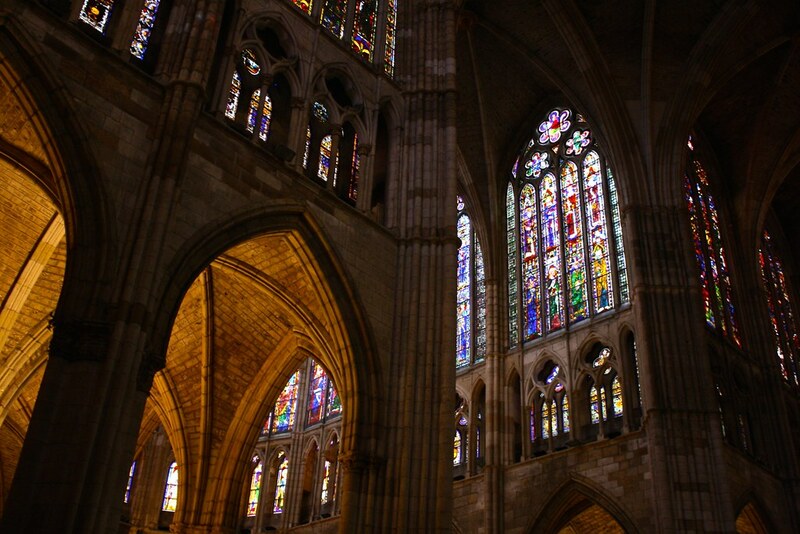 Eighty-seven—that’s the number of Catholic cathedrals in Spain today. Although I didn’t grow up Catholic (I’m a Southern Baptist turned Episcopalian), this church nerd managed to visit 26 of Spain’s cathedrals that span a multitude of architectural styles and layouts when I lived in the country from 2012 to 2015. Why cathedrals? There’s nothing intrinsic about a cathedral that automatically makes them big and beautiful; they’re simply home to the cathedra or seat of a bishop. But from the Middle Ages onward, bishops enjoyed great social status, and the churches where they presided reflected this prestige with monumental works of architecture. (Fun fact: Barcelona’s soaring Sagrada Família is not a cathedral, as it is not the seat of the bishop of the diocese of Barcelona). With so many cathedrals to see in Spain, it’s hard to know what to focus on. 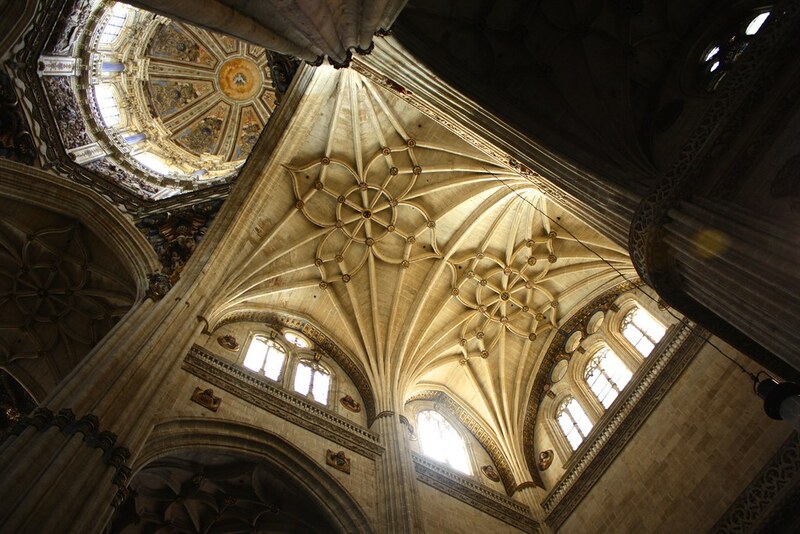 Below I’ve composed a list of my top ten favorite ones, which includes crowd-favorites like the cathedral of Sevilla as well as off-the-radar churches like Teruel Cathedral. Córdoba’s Mosque-Cathedral almost single-handedly drew me to Spain so many years ago (almost, because the other hand was the Camino de Santiago pilgrimage). What was once the Grand Mosque of Córdoba, and today is the Cathedral of Our Lady of the Assumption, deserves the title of the most interesting building in the world. 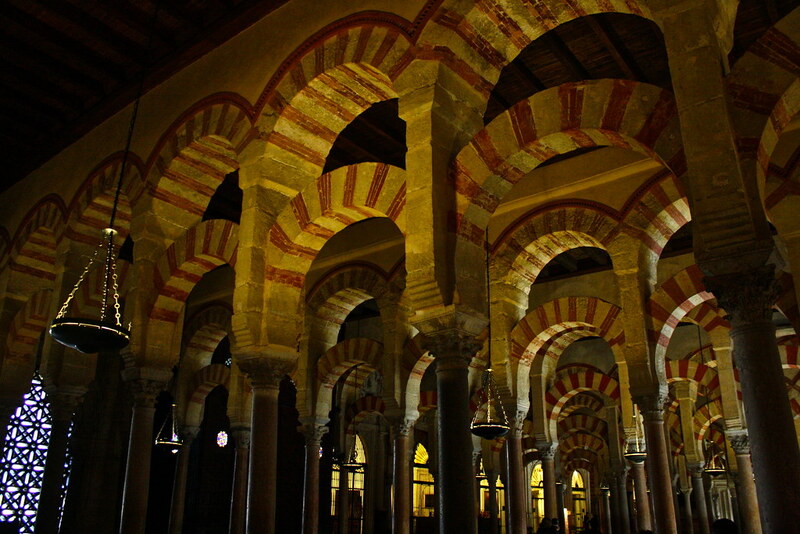 In many ways, the Mosque-Cathedral is a microcosm of Spanish history. Here, spolia or repurposed Roman columns decorate the prayer hall that seems to stretch to infinity. A glassed-over crevice in the floor offers a glimpse of the old Visigothic church upon which the mosque was built in the 700s. The dizzying array of double arches that fly from one column to the next are a masterpiece of Islamic architecture, but the horseshoe arch itself that today we think of as quintessentially Islamic was actually borrowed from the Visigoths in Iberia. 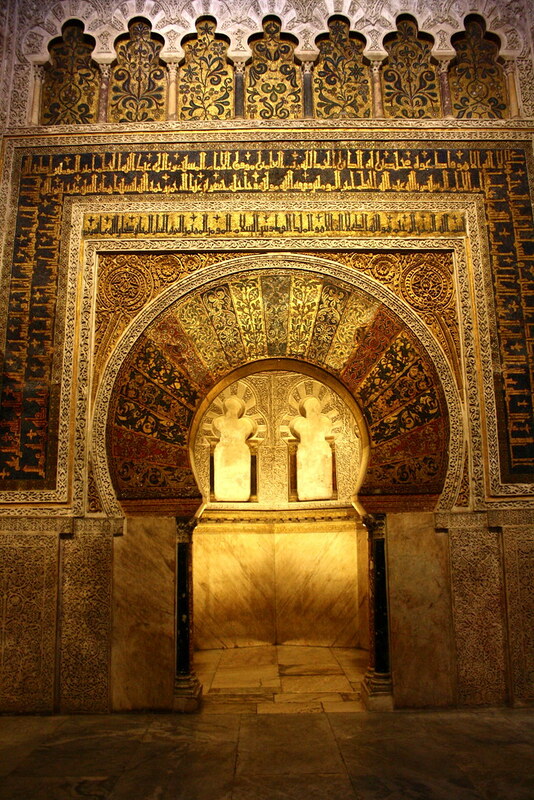 The dazzling mihrab or niche that orients prayer toward Mecca is dripping in gold that was a gift of the Byzantine emperor, a gift when Spain was at the center of the civilized world. And then there’s the main chapel, a towering Gothic/Renaissance cross-shaped hall built in the dead-center of the old mosque. This intrusion is so abrupt, it seems as if a cathedral from northern Spain has been teleported to the south and dropped on top of the prayer halls. In many ways, this is a metaphor for what happened in the Late Middle Ages as Christian armies “re-” conquered the Muslim kingdoms of Andalucía and ultimately expelled Jews and Muslims a few centuries later. A #ProTip for visiting the Mosque-Cathedral: you can visit for free—without tour groups!—between 8:30am and 9:30am, Monday through Saturday, in the quiet cool of the morning. I also recommend an additional summit of the bell tower, which envelops the old minaret and gives you a unique perspective of the Mosque-Cathedral’s architectural evolution. Tradition has it that when local church authorities in Sevilla were thinking about demolishing the old Grand Mosque where Mass had been celebrated for centuries (as in Córdoba), they said “let’s build such a beautiful and impressive church that when people see the finished product they’ll think we were crazy.” Crazy they were, indeed; they ended up building the world’s largest Gothic cathedral and the third-largest church building anywhere. At night, this gargantuan complex appears like a barge drifting through the old town, the bell tower a lighthouse that orients locals and visitors alike. 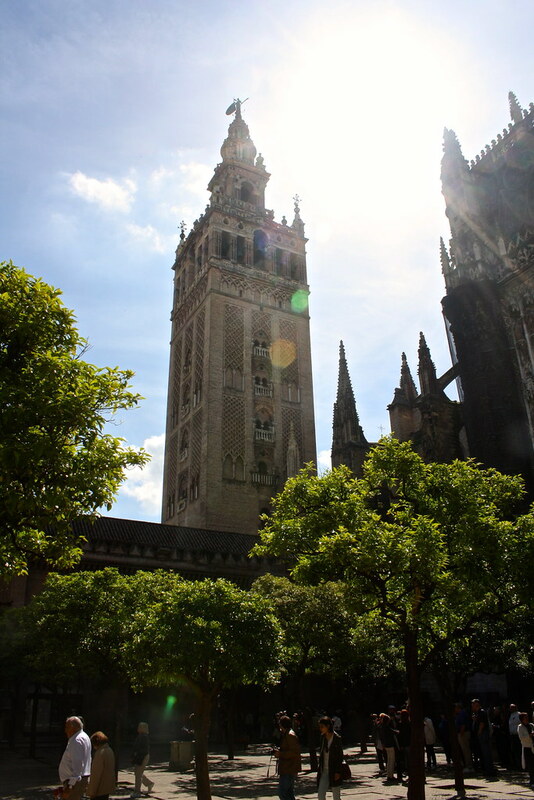 This bell tower, known as La Giralda, preserves the old Almohad-era mosque’s minaret, which was built with 35 ramps to allow the muezzin to ride up on horseback and call the faithful to prayer. 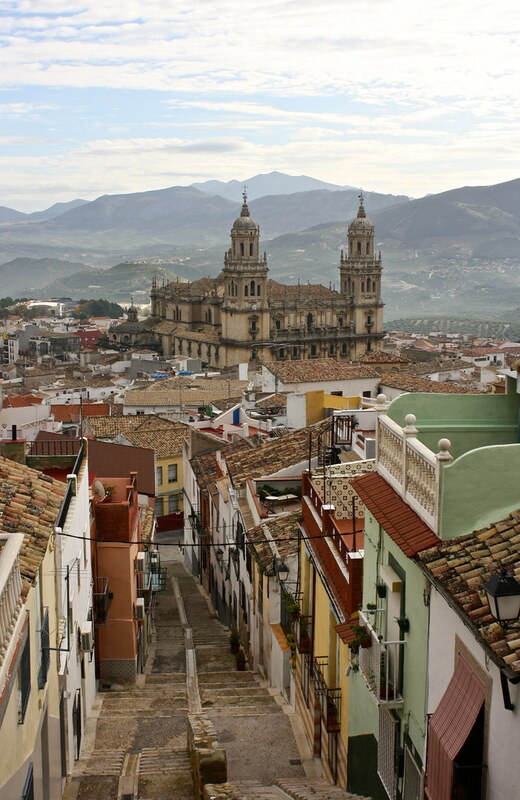 Today you can still hike up over 300 feet and get panoramic views of Sevilla from the belfry. Within the church are buried Christopher Columbus as well as the Saint-King Fernando III—who led Castilian armies deep into Muslim-held territory in the 1200s—and his son, King Alfonso X the Wise—who pioneered the use of vernacular Castilian in his court over Latin. Outside, the Islamic vision of a heavenly Paradise is realized in the old ablutions court: the Patio de los Naranjos or “Orange Tree Courtyard.” Fenced in by the old mosque’s only remaining walls (look for the horseshoe arches and stair-step crenellation on top), this courtyard overflows in springtime with the sweet fragrance of azahar, the orange blossom. I remember the first time I saw Santiago’s cathedral. Weary from having finished hiking 70 miles of the Camino de Santiago over five days, I stumbled into the Praza do Obradoiro square and looked up at the imposing bell towers barely visible through the fog, their granite stones dripping with ferns, moss, and bright orange lichen. These towers led me out of the cold, gray square and into a welcoming, quiet narthex that protects the Pórtico da Gloria, the best collection of medieval sculpture in the world. The daily pilgrim mass began not long afterward, with announcements of how many pilgrims had arrived that day, their nationalities, and their starting points. In keeping with centuries-old tradition, several men in dark-red robes carried out the custom of swinging the botafumeiro during Mass, a human-sized thurible that is swung from one end of the transept to the other and which spews fragrant, heady incense as it goes. When combined with brilliant organ music, the angelic notes of the cantor, and the shiny, hulking altarpiece covered in layers of gold leaf and dust…the whole experience was overwhelming. 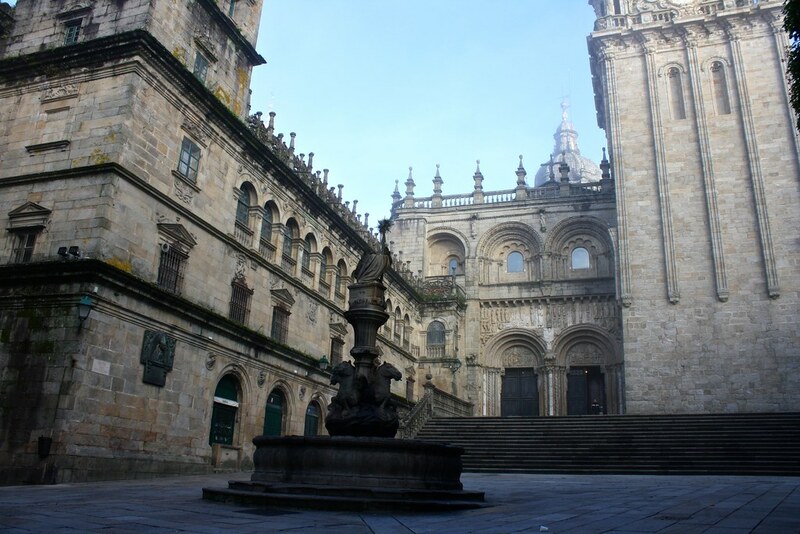 The Cathedral of Santiago de Compostela has served as a pilgrimage church for over a thousand years, drawing the faithful and the adventurous from all corners of the world along the Camino de Santiago or “Way of St. James” to a basilica that honors what the Catholic Church claims are the remains of the Apostle St. James the Greater (Santiago el Mayor). This sprawling shrine was once a pure Romanesque temple built during the 12th-Century Renaissance, but over the centuries it gained Gothic towers, Renaissance chapels, and even a total Baroque makeover. My favorite corner of the cathedral actually doesn’t belong to the church proper, but is instead its own parish church: Santa María a Antiga da Corticela. Long since absorbed into the physical fabric of the cathedral, Santa María a Antiga gives you an idea of what a Romanesque church would have been like in the 1200s: huge, massive walls and columns bear the weight of the structure, wooden beams support the roof, and tiny slits let in sparse sunlight. León’s cathedral was one of the very few churches I visited that made me involuntarily say “Wow. WOW.” and then search for a seat in one of the pews to take in the dazzling scene before my eyes. If you’ve seen one, you’ve seen them all…except for the cathedral of León. Almost 20,000 square feet of stained glass covers the entire clerestory level of the cathedral from front to back—so much stained glass that the filtered sunlight takes on an otherworldly cast. León Cathedral’s architecture feels more at home in France than on the high plains of north-central Spain. 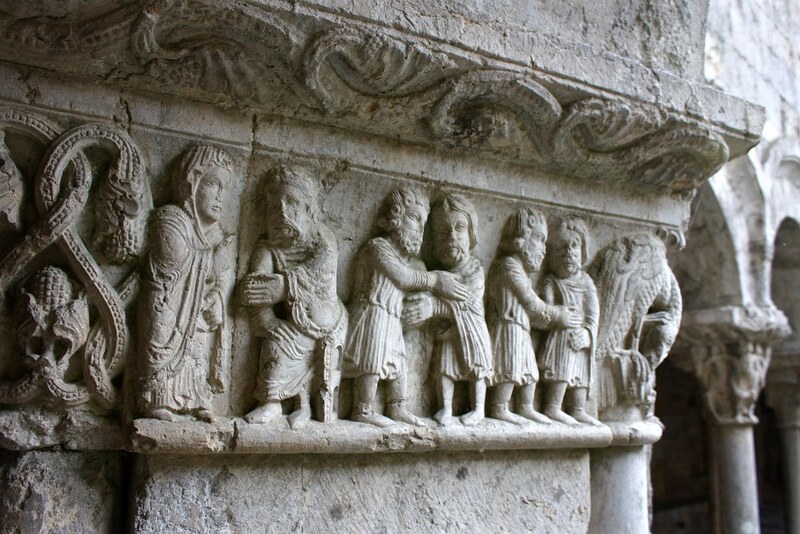 Being one of the major stops along the Camino de Santiago’s camino francés or French Way in the Middle Ages, León received countless travelers from across the Pyrenees who brought French innovations with them along their way to Santiago de Compostela. Because of this, Léon’s cathedral is a fine example of the French Gothic style, found right in the middle of northern Spain. Most cathedrals you can see in Spain are usually the third or fourth iteration of a church at that same location, which means the community had demolished an older building to build the current construction on top of the foundations of the old one. Not so in Salamanca, where the old and the new cathedral stand literally side by side. The fact that one of the walls of the old cathedral has been incorporated into the new one is kind of cool…for about five minutes. Then you move on to bigger and better things, like ascending to the upper galleries and getting some rooftop views. What makes this oddity in the world of Spanish cathedrals interesting is that you can see the progression of Western architecture moving from the late Romanesque all the way up through the Baroque era, preserved from destruction! The Catedral Vieja (old cathedral) presents you with one long, gloomy central nave that leads your eyes up to…pointed arches? You’d be forgiven for thinking you were in a Gothic church, but the old cathedral actually shows off a unique architectural style called Late Romanesque, a transitional form on the way to the Gothic we know and love. And these pointy arches hold up a surprise at the crossing: a stunning double-drum pendentive dome that makes you feel like you’re in a Byzantine-style church from the 6th century. The Catedral Nueva (new cathedral), meanwhile, combines three different styles together: light scatters in via vast Gothic windows, an idealized Renaissance dome crowns the high altar, and Baroque “glop” (to borrow Rick Steves’ word) drips from one corner to the next. 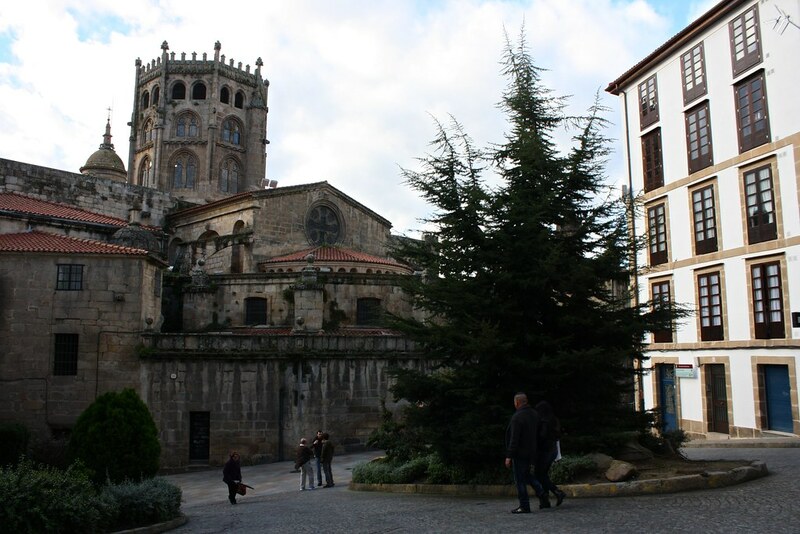 The city of Ourense makes for the perfect daytrip from Santiago de Compostela, between several pedestrian bridges that cross the stunning Miño River, restaurants that serve up the best Galician-style octopus in the region, and a series of relaxing riverside hot springs. I found myself in town here no fewer than half a dozen times during my two-year stay in Santiago. 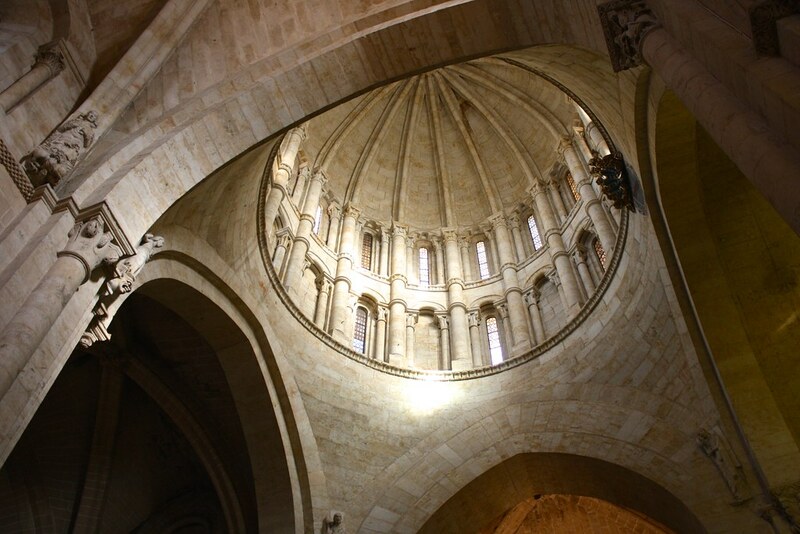 One of my favorite simple pleasures (i.e., free things to do) in Ourense was visiting the cathedral, a dizzying hodge-podge of architectural styles from the outside but a serene sanctuary on the inside where the beauty of Late Romanesque really shines through. 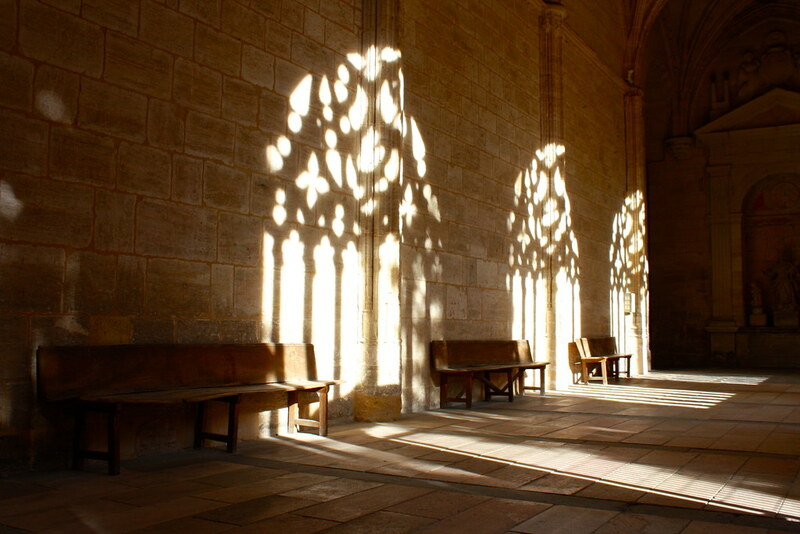 Unlike the dark spaces of Santiago’s cathedral or Salamanca’s old cathedral, Ourense’s feels bright and welcoming, for the original narrow “punched-out” windows have been preserved and let the sparse Galician sunshine trickle in. But I haven’t included this obscure cathedral on this list just for sentimental reasons. Ourense’s cathedral is home to an exquisite collection of medieval sculpture—the Pórtico do Paraíso—that equals the dizzying wonder of Santiago de Compostela’s Pórtico da Gloria with its array of saints and angels, but rivals it for retaining all the original polychrome paint from the Middle Ages, now restored to its original glory. It should be a crime how underrated Jaén is. Just an hour north of Granada in southern Spain, the queen of the olive groves has everything from several intriguing historic neighborhoods and a 130-year-old bar to some subterranean Arab baths and a mountain crowned with a castle and panoramic views. 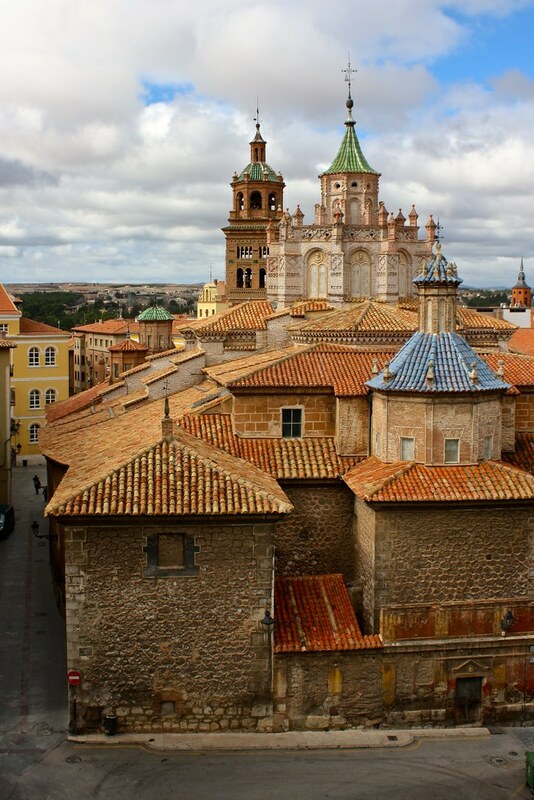 Jaén’s also got one of Spain’s finest cathedrals…yet nobody ever talks about it! If you ever visit, you’ll get to have this stunning piece of Renaissance architecture almost all to yourself. 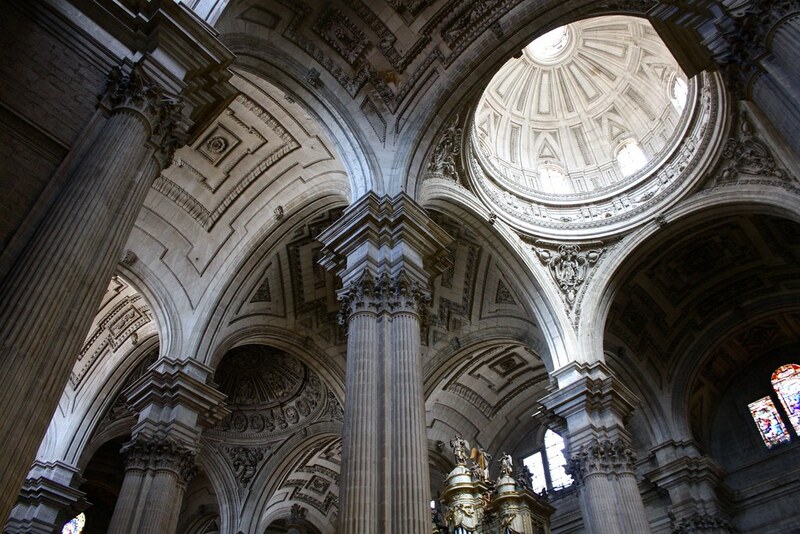 True to its Renaissance form, the cathedral is dripping with idealism: perfect forms like circles, squares, and circles within squares abound, as do the classical orders of columns and triumphal arch-shaped windows. Unlike most cathedrals where you have to pay extra to visit the upper floors and secret passageways, Jaén’s cathedral lets you explore the galleries at no extra charge, which means you can freely stroll above the church, take in the cruciform floor plan, and appreciate the intricate details on the ceiling. 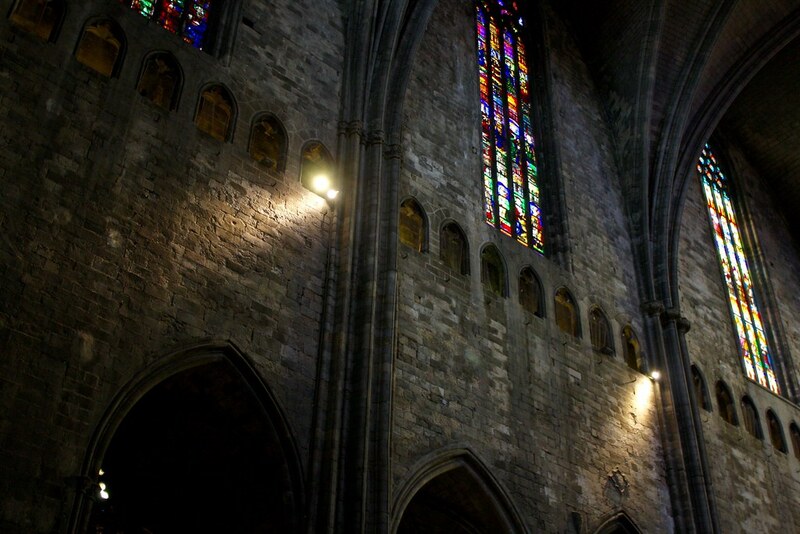 I couldn’t finish this list without including a Catalan Gothic church, and Girona’s cathedral fits that bill. 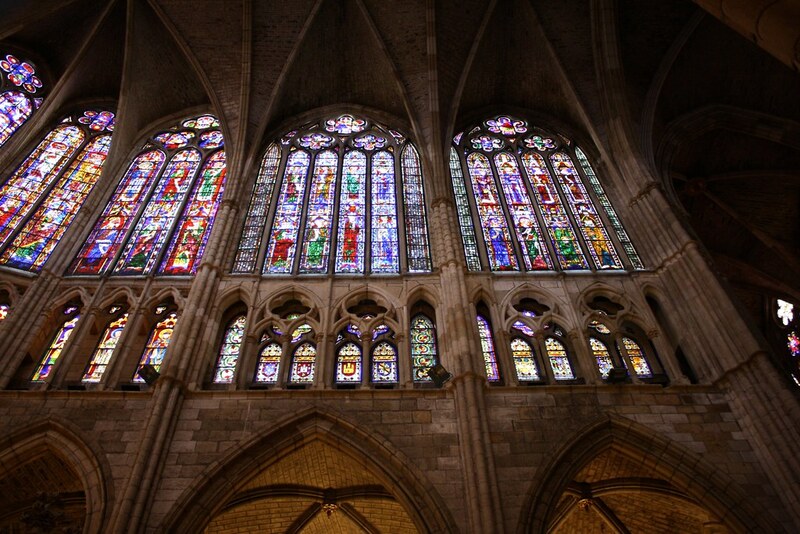 What makes Catalan Gothic so special, as opposed to French Gothic, or whatever? It’s a really subtle distinction, but most Gothic churches that you can find in Catalunya in far northeastern Spain will usually feature a single vast nave with no side aisles, flat roofs, smooth walls with little ornamentation, and octagons as the plan for supporting pillars and bell towers. You reach the cathedral by climbing up a grand public staircase—just as you would have done to reach the old Roman temple 2,000 years ago—and by passing beneath an ornate façade that was added during the Baroque era. Behind this façade, the world’s largest Gothic nave opens up at 75 feet wide. There’s more I could say about this church, but what really caught my eye was the tiny punched-out windows of the triforium that run around the whole length of the church. Seeing tourists passing from one gallery window to the next made me feel like I was in a fantasy novel set in medieval times, with princesses, monks, and noblemen hurrying between chambers. The cathedral of Girona is also a perfect place to appreciate medieval sculpture in the Romanesque-style cloisters out back. Instead of adhering to the classical column orders like Doric, Ionic, and Corinthian, stonemasons in the Middle Ages treated column capitals like blank canvases, decorating them with scenes from the Bible or with characters from a medieval bestiary. Almost the entire life of Christ is depicted in sculptural form…along with what looks like the Starbucks mermaid to modern eyes! I’ve got a penchant for the obscure, so don’t be surprised that one of my favorite cathedrals is found in a city whose marketing campaign several years ago was “Teruel Exists!” This mid-sized town may be isolated deep in the reaches of rural central Spain, but it’s the capital of a style of architecture found only in Spain. Mudéjar refers to a combination of the Gothic forms that were popular during the Middles Ages with Islamic-inspired embellishments made from tile, brick, plaster, and wood. There’s a ton of Mudéjar-style parish churches in Teruel, but the cathedral really shines. On the outside, an intricately-decorated square bell tower straddles a city street, creating a fairy-tale tunnel. The cathedral’s walls offer an assortment of brick, stones, and crumbling plaster that delights the eyes with colors and textures. 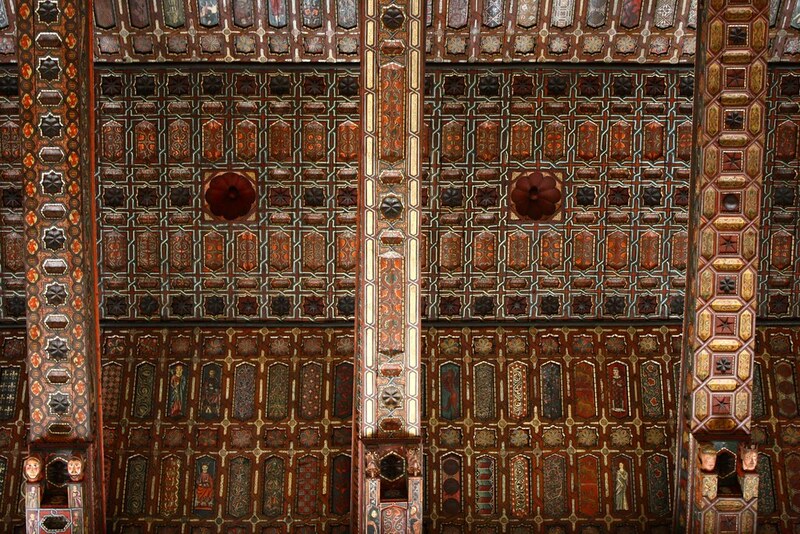 Once inside, you look up to the ceiling and suddenly need to find a pew to sit down in; the multicolor painted beams and rafters leave worshippers and visitors alike spellbound, as eight-sized stars formed by braided lines glimmer from one side of the church to the other. Although it’s not a city I think I could ever call home, Segovia ranks up there pretty high as one of my all-time faves in Spain. It sits just a quick, half-hour high-speed train ride through the mountains north of Madrid, but feels a world away, what with a stunning Roman aqueduct that spans a vast public square, a turreted castle that was the inspiration for Walt Disney’s Sleeping Beauty castle, and the world’s youngest Gothic cathedral. I love this cathedral so much because it’s built in such warm local sandstone and has such large windows that you feel almost euphoric walking into the soaring space that’s filled with light. And although you have to pay a couple euros extra for it, you can even go on a guided tour of the tall bell tower and get panoramic views of the historic core of the city. 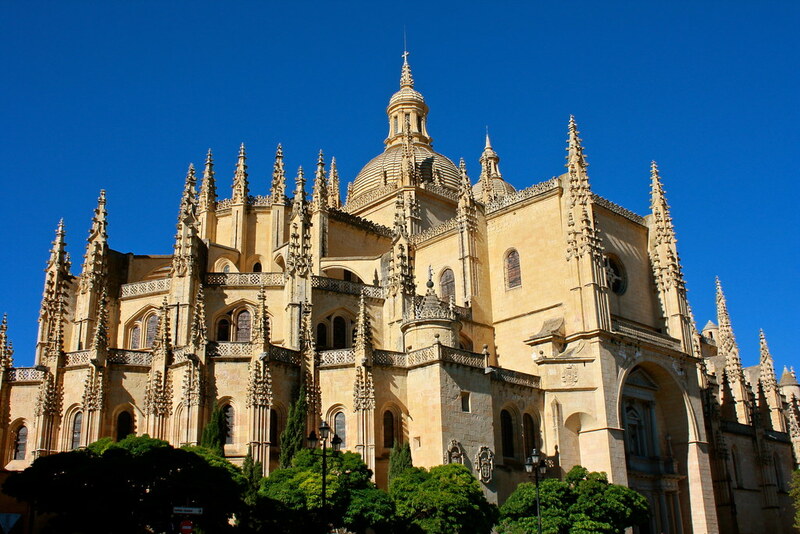 What’s your favorite cathedral in Spain? Share yours below in the thread for commenting!